Having tested the metro and the tram on our second day in the city, we decided to take to the water on our third, using the Oslo Pass for the ferry to Bygdøy, the museum island of Oslo. There are six museums on the island but we reckoned trying to see all of them would push our culture-o-meter up to the max, leading to brain overload and the distinct possibility of a family fight. Far better to choose two and try to do them properly. 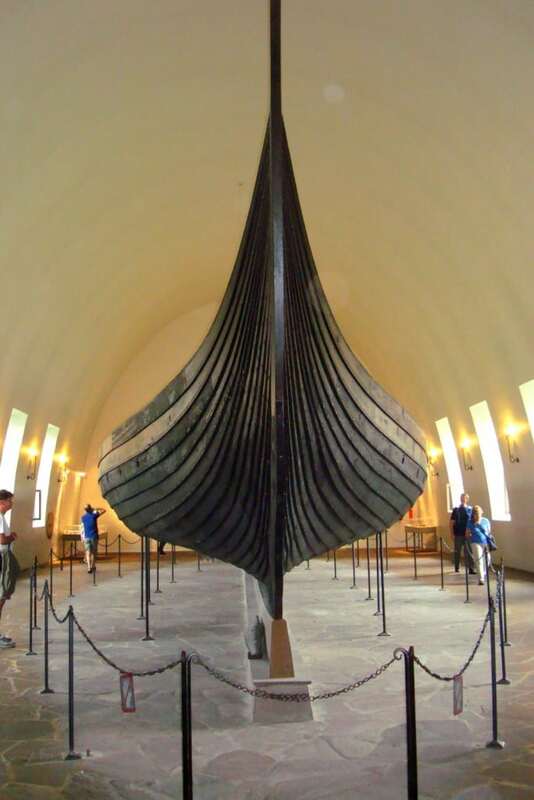 First up, the Viking Ship Museum. Having been fascinated by the idea of a ship burial from our visit to Sutton Hoo in Suffolk, it was a real treat to see the world’s best preserved examples which had been buried along the Oslo fjord over 1000 years ago. The museum is spacious and simply designed to showcase the three striking vessels. Artefacts from the graves can also be seen plus videos explaining some of the issues archaeologists are now facing with regard to the future preservation of the ships. Our second choice on Museum Island was a short walk away but the clouds were looking rather threatening so we hovered for a couple of minutes by the bus stop and were rewarded when a bus came along almost immediately, just as the heavens opened. It dropped us off at the door of the Kon-Tiki museum so we ran in to escape getting wet. The irony wasn’t lost on us: trying to escape a bit of rain by bolting for shelter in a museum dedicated to men who crossed the Pacific Ocean in treacherous conditions on a balsa wood raft. Now, some museums I can whizz round quickly and get the gist of them. Once in a while a museum is so expertly put together that you read every word on the information boards, you sit and soak up the atmosphere and you feel sad to leave. The Kon-Tiki Museum is such a place. Learning about Thor Heyerdahl and his fellow explorers, their bravery and tenacity, was really quite astonishing. And how lovely to have corresponding information for children written underneath, at their height. 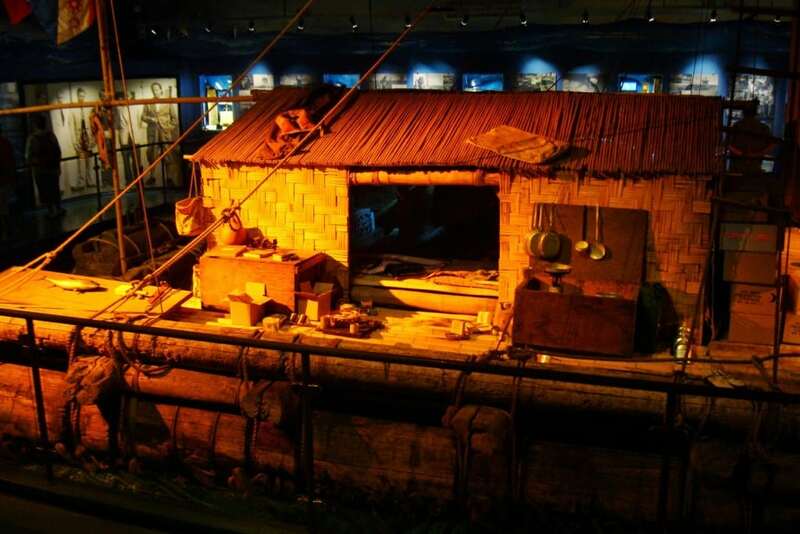 Again, the museum was a beautiful space: the two crafts, Ra II and Kon-Tiki itself, were bathed in warm light and were exhibited with all the equipment and supplies Heyerdahl and his team would have taken with them. Just perfect. The gods were again on our sides as we left the museum and sought a way back to the city centre. The hop on-hop off mini cruise, which happened to be free for 72 hour pass holders, was just about to leave. We hopped on and 15 minutes later hopped off at Tjuvholmen, the location of our hotel (The Thief). As black clouds gathered once again, and thunder rumbled, we spotted a bakery, Bergshaven, which, considering everything else we had eaten in Oslo had been very pricey, was surprisingly reasonable for the most deliciously fresh ham salad rolls and carrot cake. We snuck them back up to our room, made ourselves some coffee and sat with the balcony doors open to watch the storm pass. This was proving to be an exceptionally good day for the Burgess crew. Normally we miss buses, get timings wrong, are victims of unseasonal weather and inappropriate footwear. This was a day where everything went right although there was still a fair chunk of the afternoon to go. Despite Rory’s pleas for us to stay put, we were able to persuade him to walk with us to the Nobel Peace Center. Good decision as this was just the thing for a young lad hoping to study politics at university in September. With permanent exhibitions devoted to the influential winners of the Peace Prize, plus an interesting temporary exhibition on social media and democracy, there was much here to make you think. A walk around the grounds of Akershus castle was our final attraction for the day and it was all going well until Dougie made the fatal mistake of suggesting ‘just one more museum’. To be fair, Norway’s Resistance Museum was an insightful, educational place but it deserved the attention of visitors who we weren’t footsore or grumpy. This is the one disadvantage of having a city pass – the urge to see everything because the ticket price is included. We should have learned from our own success that morning on the museum island – less is more. We forgave Dougie because he made an excellent choice for our dinner that night. A two minute walk away, the Rorbua restaurant specialised in North Norwegian fare and was decorated like a rorbu (fisherman’s house). A gorgeous little place with huge helpings of traditional dishes and a much appreciated 20% discount for holders of the Oslo Pass. 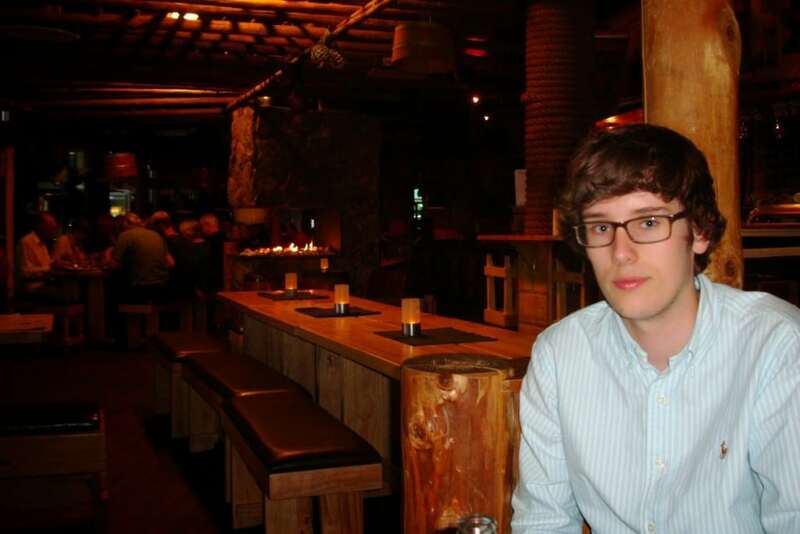 Rory grudgingly posed for a photo (unlike his disagreeable expression the previous day on the metro) although I made sure he was at the side so you, dear reader, could get an idea of the restaurant. Restored by food and beer, we sauntered along the boardwalk in time to see Norway’s version of The One Show being filmed in a little studio on the waterfront. A fair number of Oslo residents were watching the interviews and it was all quite exciting, despite us having absolutely no idea who anyone was…. OK.OK. You win. I am jealous. I want to go to Oslo. Right now. I definitely want my own long boat. I'll check to see if they loan them out…. I didn't see that episode with Neil. Will have to see if I can find it. THat is a lovely picture. Were the boards at the museum in English too then? That is good. Yes, I should have said, English boards plus a couple of other languages too. Everywhere we went, English was written as well as Norwegian. No problems being understood either. ps. go hug him now….and kiss him…and don't be cross when he goes 'ok mom…enough'..'cos in september you will wish you had hugged and kissed him more…. What a gorgeous longboat. They certainly knew how to build to an elegant, efficient design in those days! The museums all sound incredibly interesting! What a brilliant city to visit. I hate all this waiting, Sarah. I just wish we knew one way or another. The thought of flats and our independent sons…can't get my head around it. It was fascinating – just the right amount of information too for people like me who just have a smattering of knowledge. We were very taken with Oslo just as we were with Stockholm and Copenhagen too. Just need Helsinki to complete the set!